After Tsunami, Japanese Turn To Ancient Rituals The Japanese are beginning to hold memorial ceremonies for people killed in the earthquake and tsunami. Times of crisis lead many people to seek strength and comfort in religion. In Japan, the focus will be on honoring the dead, and moving on with life. A religious statue stands amid the debris left by last Friday's tsunami in Natori, Miyagi prefecture. 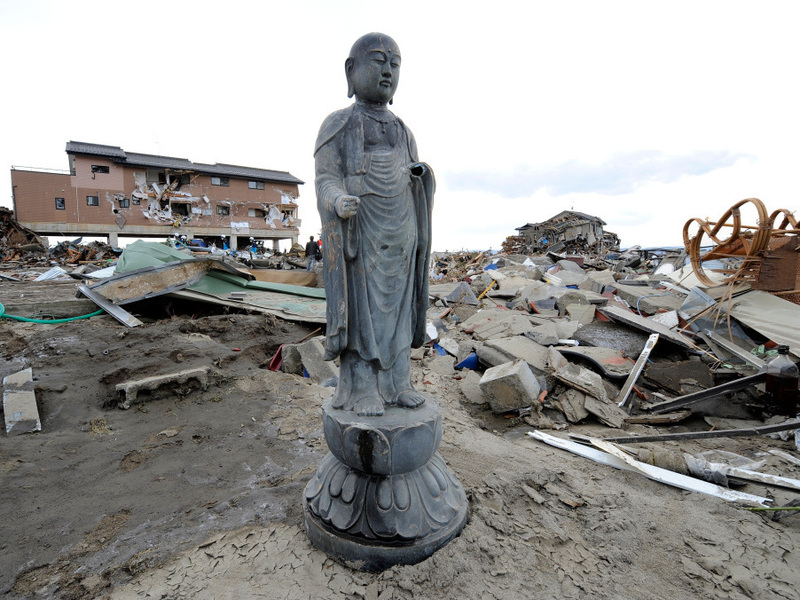 Many Japanese will turn to Shinto and Buddhist rituals as they cope with the disaster stemming from a powerful earthquake. The Japanese are beginning memorial ceremonies for people killed in the earthquake and tsunami. Times of crisis lead many people to turn to religion for strength and comfort. In Japan, the focus will be on honoring the dead, and moving on with life. On Monday, Tokyo Gov. Shintaro Ishihara startled many when he said, "The Japanese people must take advantage of this tsunami to wash away their selfish greed. I really do think this is divine punishment." The governor soon apologized. But people were shocked, not just because it seemed to blame the victims — but also because it is so at odds with the beliefs of modern-day Japanese. "They know about tectonic plates, geography, geology — they know why tsunamis happen," says John Nelson, an expert on Asian religions at the University of San Francisco. "And they don't need some governor to say it's the will of heaven that this happened," he says. Nelson says that while Japanese society is largely secular, events frequently drive them back to ancient traditions. "There's a famous saying in Japanese that, 'People turn to the gods in times of trouble,' " he says. "And I think we'll see that here." The rituals of Shinto and Buddhism permeate Japanese life. And in these two belief systems, scholars say, people do not focus on why the tragedy happened, but on how they should proceed. Duncan Williams is a Buddhist priest who just returned from Japan. "We can't pinpoint exactly what brought this about," Williams says. "I think the takeaway is that, for Buddhists, it almost doesn't matter what caused this situation; what's important is the response." That response, he says, should include showing patience, resilience and self-sacrifice in the face of tragedy, and memorializing the dead. Ian Reader, professor of Japanese studies at Britain's University of Manchester, says that when honoring their loved ones, most Japanese turn to Buddhist rituals, where priests read scripture and chant sutras before the body is cremated. "The general perception is that you do need rituals to be done, to help the passage of the spirit from the realm of the living to the dead," Reader says, "and also to separate the spirit from this realm." And if those rituals are not performed, says Brian Bocking, an expert on Asian religions at Ireland's University College Cork, bad things can happen. "A spirit of an ancestor who's not properly memorialized can cause problems in the family, in the home, in the business and so forth," he says, "because they're unhappy, they're not being looked after properly." But what if a body — or thousands of bodies — have been washed out to sea? Bocking and others say Buddhist priests can hold mass memorials for the dead, and they are likely to do so in the next few days. After the funerals, when people begin building new homes and their lives, Shinto will move center stage. If Buddhism deals with death in Japan, Shinto deals with life. At the center are kami — life forces that are a little like deities and are ever-present. "The deities have two faces," says Nelson, of the University of San Francisco. One face is benevolent, as the deities help people in their day-to-day lives. "But those same deities have this wrathful side," he says, "which can manifest itself at unpredictable moments." And people turn to Shinto priests and rituals, he says, to restore the balance between the human and the divine. The Japanese appeal to Shinto deities at the beginning of things: the birth of a child; a wedding; a new home; a new car. Professor Brian Bocking says that Japanese companies send delegations to Shinto shrines, and many have their own shrines. "And this is not because all the employees are devout followers," Bocking says. "Or, it's just that everyone in Japan knows there's all sorts of things that could happen in life — and why not get the gods on your side? I mean, they might not exist. But if they do, you might as well invoke them." Which is what the Japanese will be doing, as they cope with a tragedy not seen in a generation.